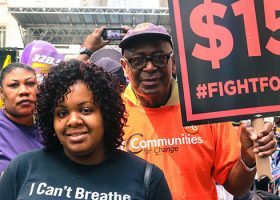 The Fight for $15 is a grassroots movement of low-wage workers that seeks to undo decades of wage stagnation and growing inequality by raising the wage floor to more robust levels. 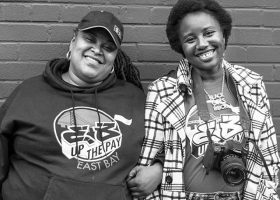 The movement, which began in New York City in 2012 when fast food workers walked out of their jobs to demand $15 and a union, has spread from coast to coast, shaping the national conversation around wages and inequality, and helping push through dozens of state and local minimum wage policies. 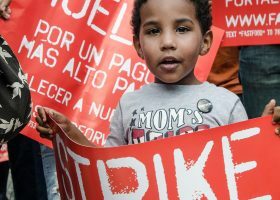 Building on the momentum of the Fight for $15 and the goals of the Raise the Wage Act of 2019, state and national advocates will call on members of Congress to increase the federal minimum wage to $15 by 2024, and to gradually eliminate the sub-minimum wages for tipped workers and disabled workers. 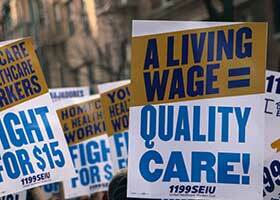 Find out what's currently the minimum wage in states and cities around the nation. Learn about recently approved minimum wage increases and active campaigns to raise the wage floor and eliminate the subminimum wage for tipped workers. Get answers to some of the most commonly asked questions about minimum wage laws and policies. Start your research here. No one who works for a living should have to live in or near poverty. Too many lawmakers and policymakers just don't get it. But when confronted with the stories of real people struggling just to make ends meet, they can't hide behind the same old tired excuses. Read the stories of people affected by poverty wages. 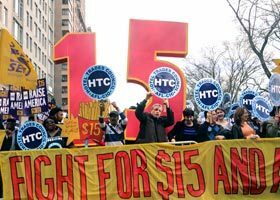 Minimum wage laws in the United States date back to the early 20th century. 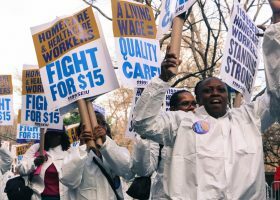 There's a long and rich history around the fight for a livable wage floor—one that carries forward to this day. Get the backstory. RaiseTheMinimumWage.org is a project of the National Employment Law Project. We proudly partner with national and local advocates to raise the wage floor to improve the lives of low-wage workers and families across America. Learn more about our work. The National Employment Law Project is headquartered in New York, with offices in Washington DC, California, and Washington State. Get in touch with us. I cannot afford to pay my bills and put food on my table to feed my 5 kids with the minimum wage at $7.25. Right now I have to rely on SNAP food stamps to make ends meet. I couldn’t afford to keep our house without working 3 jobs, which means my kids would be left alone most of the time. Being a single mom there is no way to take care of your family when the minimum wage is so low. Congress needs to wake up and see how single mothers are living. This is not right, nor is it fair that we have to struggle to live pay check to pay check. Raising the minimum wage would mean I would be able to live in a decent house with my kids without working 3 jobs, and not rely on food stamps to feed my family.